For the third year running, Green Builder Media has emerged as the best trade magazine in a competition including such heavy hitters as Inman News, The Wall Street Journal, and The New York Times. 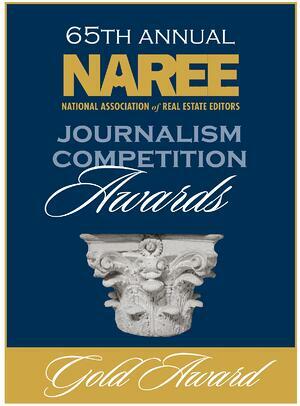 The company was presented with both the Best Residential Trade Magazine Gold Award and the Best Web Site Gold Award in the 65th Annual Journalism Awards recognizing excellence in reporting, writing, and editing stories about residential and commercial real estate. Currently celebrating its 10th anniversary leading the charge for more sustainable building—effectively both making and reporting on the news in the green building and sustainable living space—Green Builder Media proves its mettle by consistently being chosen as a standout publication delivering authoritative content that helps building professionals create the most sustainable built world possible. And while the print win is exciting as a standalone honor, the fact that the content of this publication is then seamlessly translated into the digital world worthy of yet another Gold Award, shows Green Builder Media’s focus and talent in ensuring its valuable readership is served information independent of format. “The exciting thing about the web accolade isn't the nod to our website design,” Power points out. “Anybody can make a nice looking page. It's what's happening on the back end. Our team broke new ground in 100s of different ways, vastly increasing our impressions, tracking and organizing visitors by their interests. We rewrote the way media web portals work." Co-Founder and President of Green Builder Media Ron Jones adds, "We are truly honored to once again be recognized for our authentic leadership position, which is a reflection of the genuine passion shared by our entire team for creating a more sustainable future." Long-time Green Builder Media blogger Christina Farnsworth was on hand at the 49th Annual Real Estate Journalism Conference at the Intercontinental Miami Hotel June 26 to receive the award. Check out Green Builder Media to see more of our award-winning work!